At the same time that infamous cult leader Charles Manson was busted for the second time with a cellphone in his possession, State lawmakers in California are trying to make it illegal for inmates in state prisons to have a handset in their possession. According to reports, inmates caught with a cellphone and who had used such a device "to facilitate a crime", could find 3,4 or 5 years added to their current sentence. Getting caught with a mobile device as an inmate in a California state prison could even see the inmate "lose credit for all of the time already served." And it won't pay to be an enabler either. Anyone caught trying to pass a handset over to an inmate could be charged with a misdemeanor and a $5,000 maximum fine. Last August a new federal law passed making it illegal for inmates in the U.S. federal prison system to have a wireless device while incarcinated. Those caught with such a device could have an extra year tacked on to their current sentence. The goal of the law and the proposed state law in California is to prevent prison violence, especially among gang members. 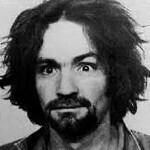 Last month, Manson was found with a hidden cellphone for the second time. Back in March of 2009, officials at Corcoran State Prison had found an LG flip phone under the inmate's mattress from which he placed calls to California, Florida, New Jersey and British Columbia. Serving a life sentence for his involvement in the Sharon Tate murders committed in the summer of 1969, Manson has continued to be rejected in his quest for parole and has been behind bars throughout the entire history of the modern cellphone. Damn ! that dude looks like a real killer maniac !!! What was the other phone? Damn!... Who's trying to talk to this guy? WTF??? ?